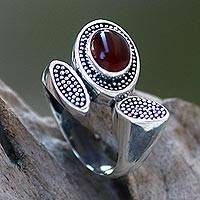 Carnelian evokes a red lotus amid seed pods in this sterling silver design. Rosalia Tarigan crafts a beautiful cocktail ring, showcasing Bali's traditional silver granule work. 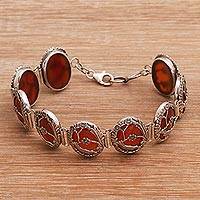 A bright and glossy carnelian stone sits boldly at the center of this rich leather bracelet. Thai artisan Chaloemphon hand-crafts the bracelet, finishing it with three brass snap closures. 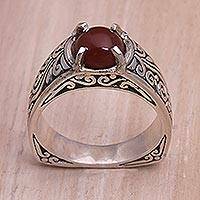 Encased in silver, carnelian's spicy hot color wears a halo. Chic and modern, this handcrafted ring is one of Rituu's contemporary designs.